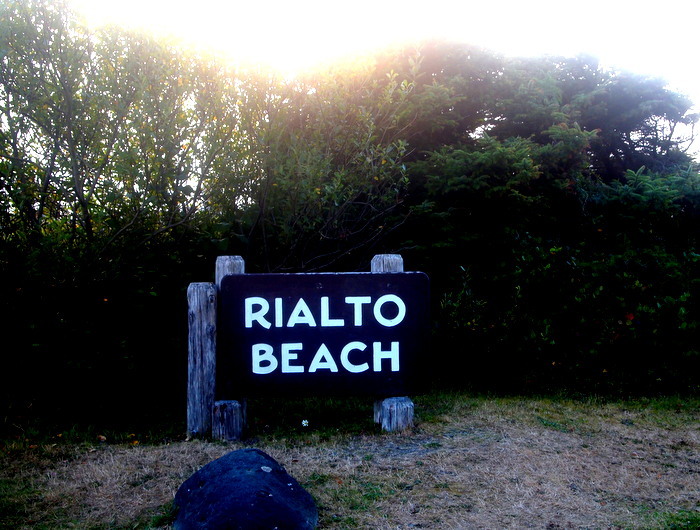 We’ve spent the past two glorious days camping just 2 miles down the road from fabulous Rialto Beach. The first day we arrived at Mora Campground mid-afternoon and after settling in took the short drive down to the beach. 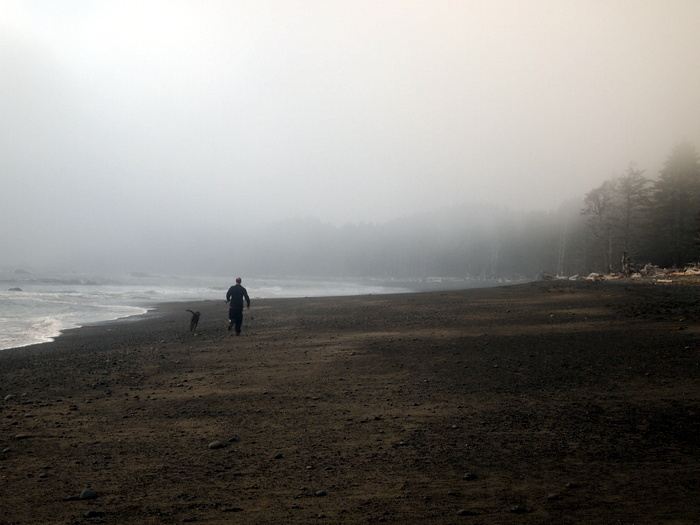 Even though the sun was shinning in a bright blue sky when we left the campground, the beach was covered with thick fog and the wind was howling. 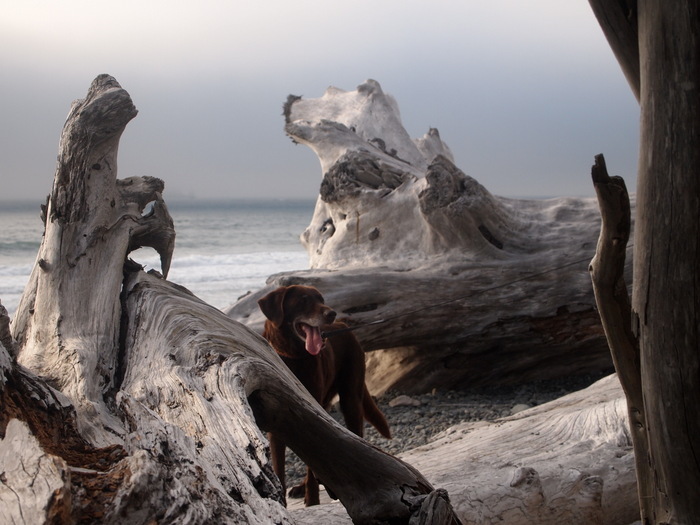 No matter, we still enjoyed wandering down the shore, marveling at the frozen in time “ghost” trees at the edge of the forest and watching Phin excitedly prance around on the rocky beach. 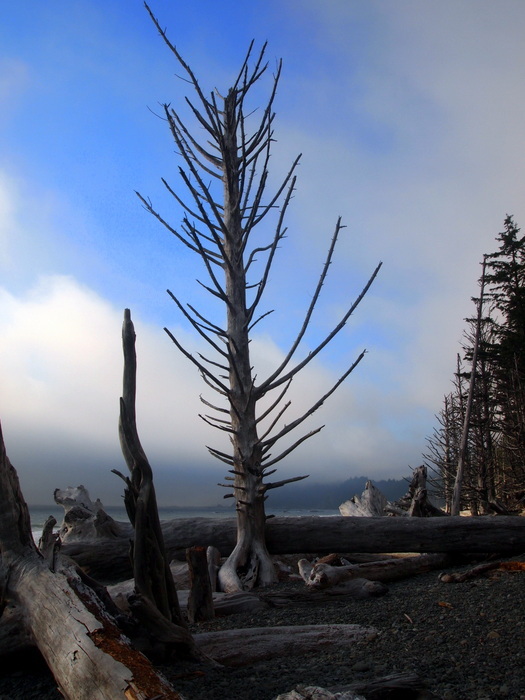 “Ghost” tree- A Sitka Spruce suffocated by the winter tides and frozen in time. They look like huge bones sticking out of the sand. Me. 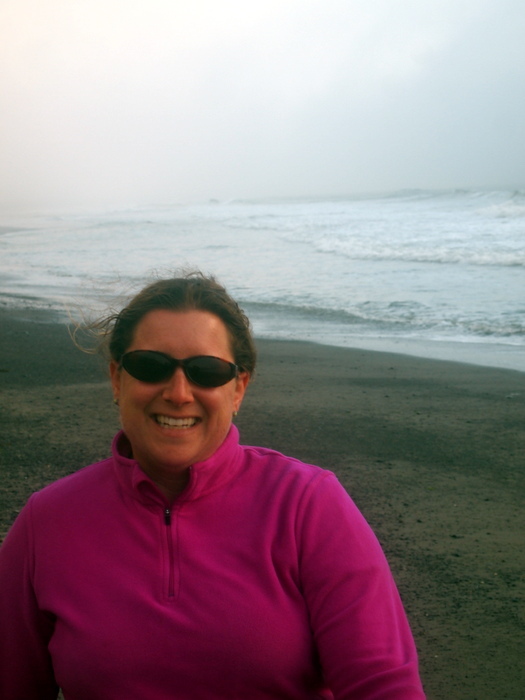 Believe it or not this was the picture where I look the least windblown! 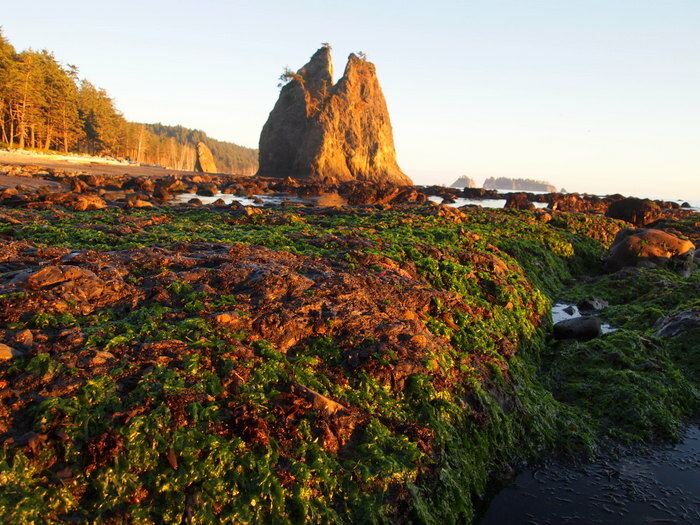 Rialto beach is best enjoyed at low tide. 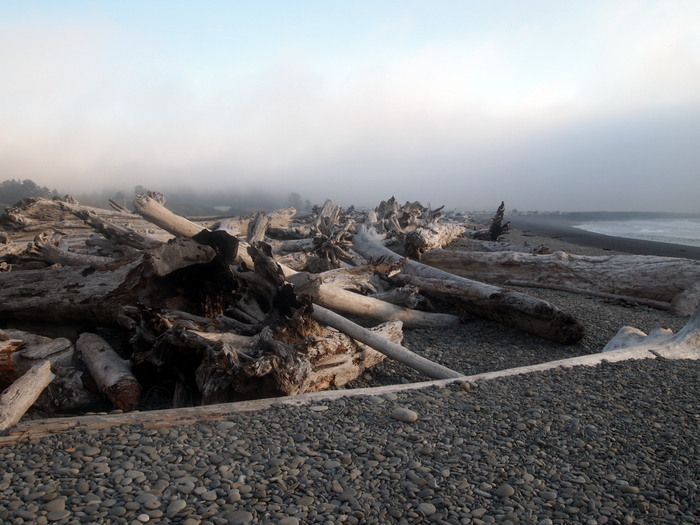 If you go at high tide you have to walk far up on the shore among the driftwood which can be rather precarious, not to mention dangerous. 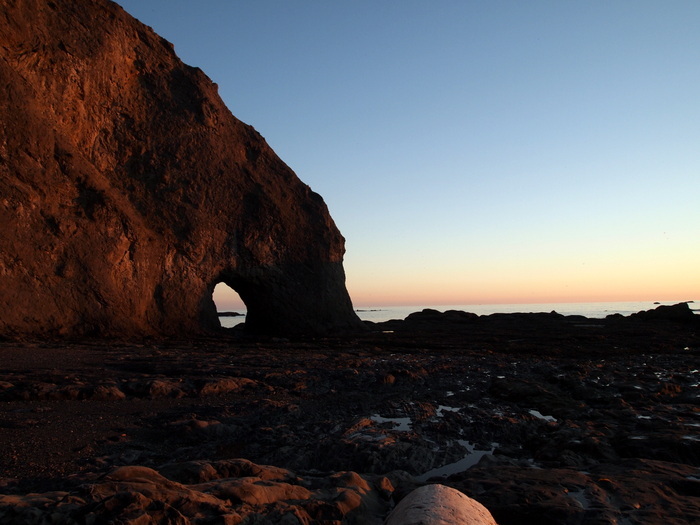 You also miss out on exploring famous Hole-in-the-Wall rock, as well as the tide pools. After consulting the handy tide chart posted at the check in station at our campground we learned that low tide for Monday was around 7:30 in the morning or 7:30 at night. Sunset is supposed to be gorgeous on the beach so after dinner we headed down to take a longer stroll. This time we got lucky and the sky was clear and blue with not a hint of fog anywhere. 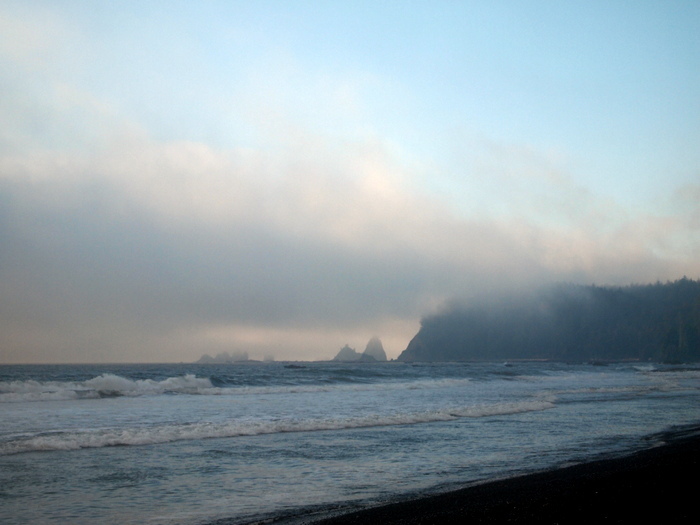 By the time we walked the mile and half down to Hole-in-the-Wall rock the sun was low in the sky making the towering sea stacks look even more dramatic. 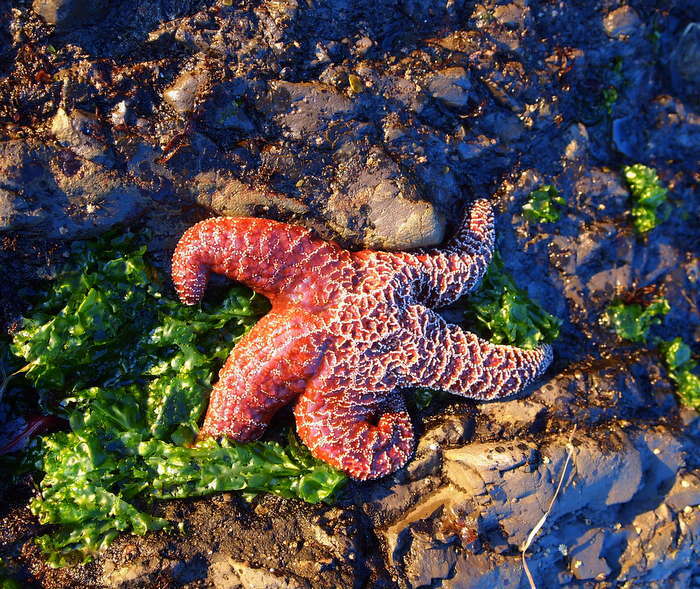 And starfish! 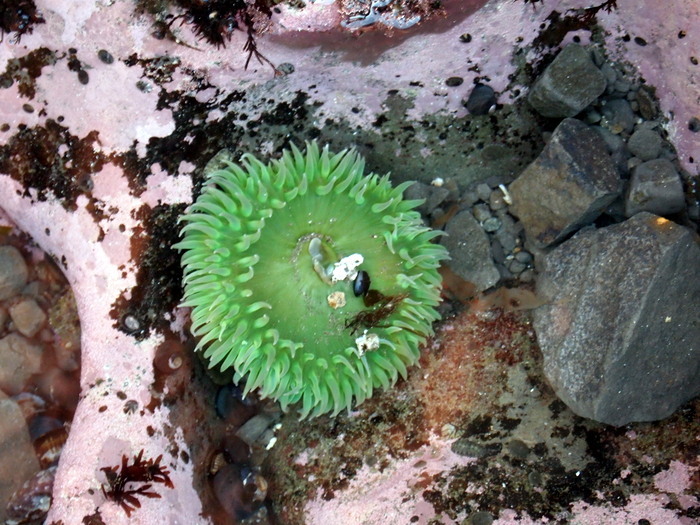 Lots and lots of them tucked among the rocks. At high tide this hole is impossible to walk through or around. You have to climb up the bluff to get around it. 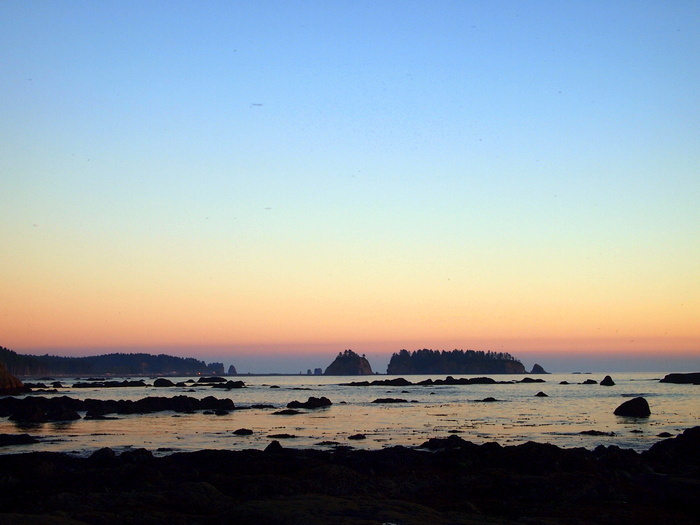 James Island. 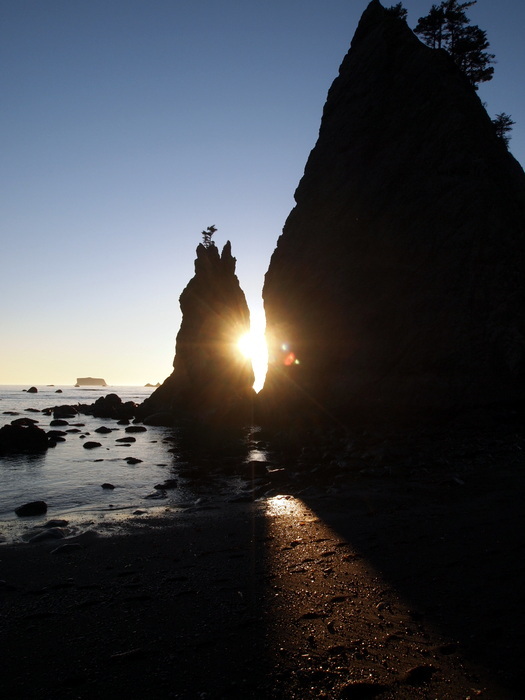 Until the second half of the 19th century it was the site of a Quileute Indian village. Today the U.S. Coast guard operates a lighthouse and foghorn atop the island. 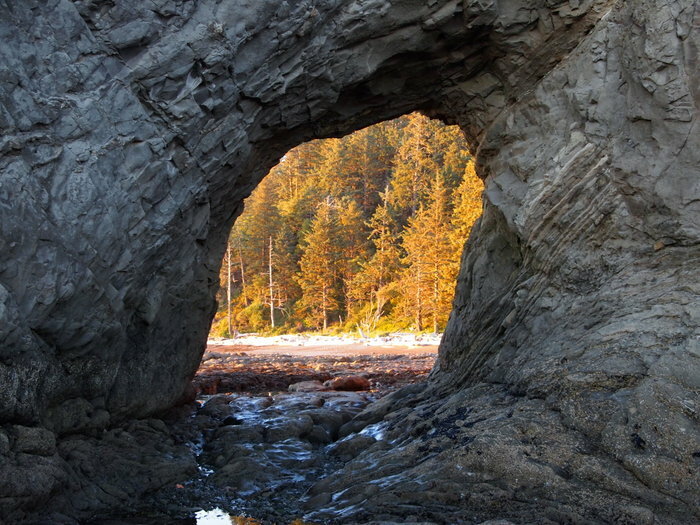 We’ve greatly enjoyed this picturesque beach and all it has to offer. 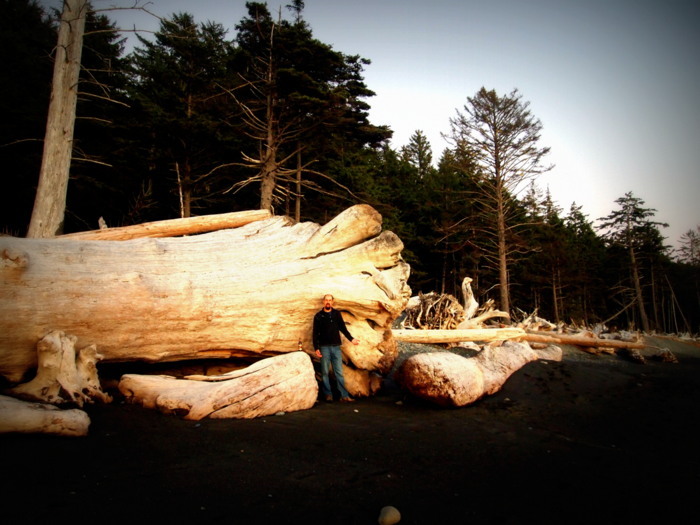 Today we’re heading over the to Hoh Rainforest for a little exploration. 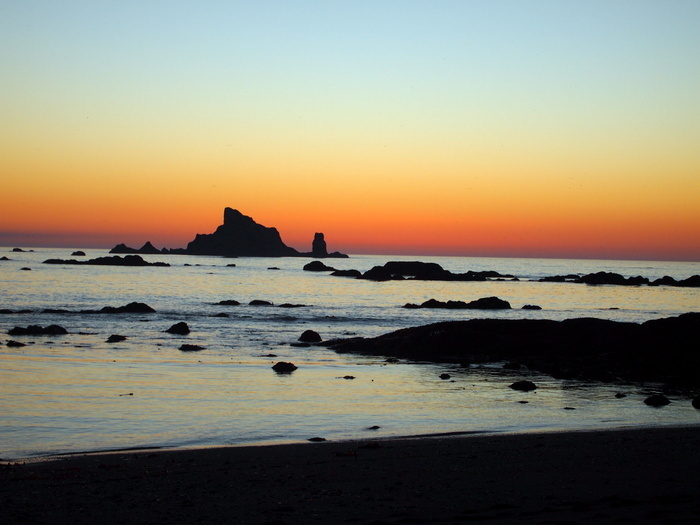 We’ll be back at the beach tomorrow though as we head down the coast to check out Ruby beach and spend a few nights in Ocean Shores. Strong Verizon signal with our amplifier but only a tiny but of AT&T. 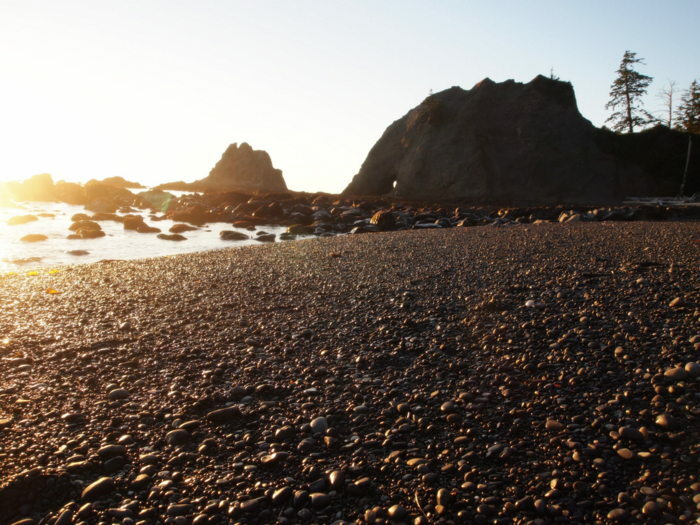 The campground itself doesn’t have much going for it except the close proximity to the beach. It’s very shady, moist and chilly, but 2 miles from the beach makes it bearable. Just found your blog through Nina’s blog. I’m anxious to follow your travel through my favorite part of the country and on to new places. 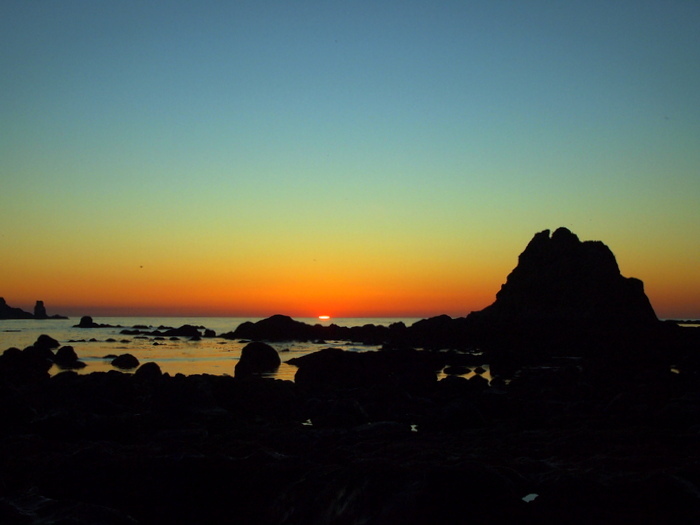 Your pictures are great–I’m anxious to go back and read previous posts. My name is Nancy. Jack is my lab. You commented on my Crater lake posting. Thank you. I had not seen your blog before that and don’t know how that happened. I have corrected that so I will see all of your future posts. I have read quite a few of your blogs and I think they are terrific. Yes, we are travelling a similar route. We just arrived in Arcata California and will be here for a week. Just curious, how did you find our blog? The wonderful folks over at Mali Mish recommended we look you up after learning that we are following a similar travel route. I’m glad we did because now we can get good ideas for our travels ahead!